Folding shovels are an old thing, but at some point somebody got the idea to add one more joint to it. 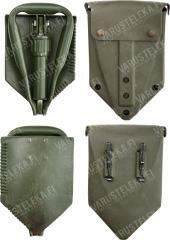 The result is a tri-folding entrenching tool, which occupies a remarkably small space. We know what you're thinking: will I get a good one? Yes you will: these are used with scratches and worn paint all over. It means they are the real thing made in Germany, not cheap reproduction trash. It's good to own a few of these actually: One in your car, a couple for gardening and six to give to your grandma as a present. The included pouch varies. 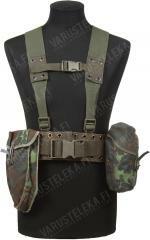 The latest batch we got (May '18) was supplied with a BW e-tool carrier with a Flecktarn camo pattern. In case of green or khaki plastic, the pouch material is flexible and strong polymer, immensely tenacious against wear and tear. On the back you'll find two "ALICE attaching things", in other words US keepers. With these you can attach the pouch to belts up to 55 mm wide. The khaki one is not original BW issue and made by Mil-Tec, but seems to be quality-wise about on par with the original. Used but in serviceable condition, at most you'll need to squirt some oil in the locking threads. As said, the plastic case is new manufacture. The most solid folding shovel I have ever seen bar none. Not overly heavy, compact (the supplied case is up to scratch, no doubt). Well worth the bucks if you are in need of a shovel. Near indestructible shovel for a good price much better than knock offs in the same range. Mine came nearly new with just a little paint worn off the corners of the shovel. Excellent! It is like new and the best folding shovel I have held. It is light and properly made like nearly all German gear. Light, sturdy, and German designed! The flecktarn case is durable and appreciated. You can easily slide webbing in between the odd German fasteners and cut off what you don't need, whether it be metal or plastic. Awesome quality at a cheap price, as per usual with these Varusteleka guys. Buy one and you will be happy! Almost new condition, minor paint chipping and some wear on the carrier. My carrier was cloth, not the plastic looking one in the pictures. Has some weird plastic attachments on the back that I need to figure out how to use but thats on me, not the product. The shovel is insanely sturdy, way better than the $10 one I have from walmart. I plan to throw it in the back of my Jeep for snow/mud and it takes up barely any space. Would buy again, would pay in the range of $30-40 USD for it. Der Klappspaten! 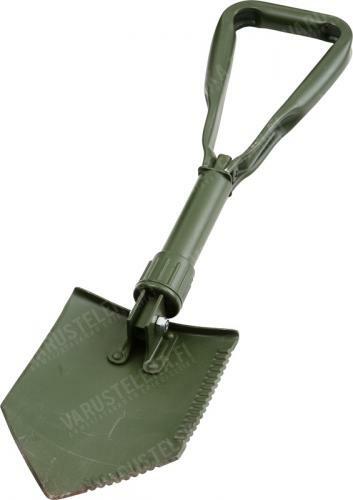 Unbeatable folding shovel at this price range. I bought two and both are in good shape. Cases are in decent shape as well. One of them did have a bolt at the spade swivel whereas the other has a proper pin, but both are solid and well made. Koska maa on edelleen roudassa poteronkaivuu hommiin ei olla vielä päästy ja lumi liikkuu toistaiseksi tehokkaammin kolalla. Meille sivistymättömille idiooteille tuotekuvauksessa olisi voinut olla maininta että Flecktarn kotelo ei välttämättä tule yleispätevillä ALICE klipsuilla vaan pelkästään leveään BW tetsarivyöhön sopivalla tapikiinnityksellä. Kätevä pikku lapio autoon taikka pikku pihatöihin. Kuokkaominaisuus plussaa. Purkki monitoimiöljyä mukaan niin lapio kestää ikuisuuden. Tough. Knocks the crap out of similar tools I have.